Your product only has one chance to make a good first impression. We supply tubes for cosmetics, medicine, veterinary medicine, and pharmaceutical products. Tube material (PE, Coex, aluminium, or laminate) that is precisely matched to the filled goods ensures lasting stability of the contents. We offer tubes with screw-on or hinged closures and a wide variety of nozzles and applicator aids for filled quantities from 1 to 300 ml. Glass and plastic bottles can feature a variety of closures and applicators, dispensers, or pumps for volumes from 3 to 1000 ml. You can also take advantage of our services such as design and tool development for your individual needs. Most of our plastic bottles are manufactured using the extrusion process. 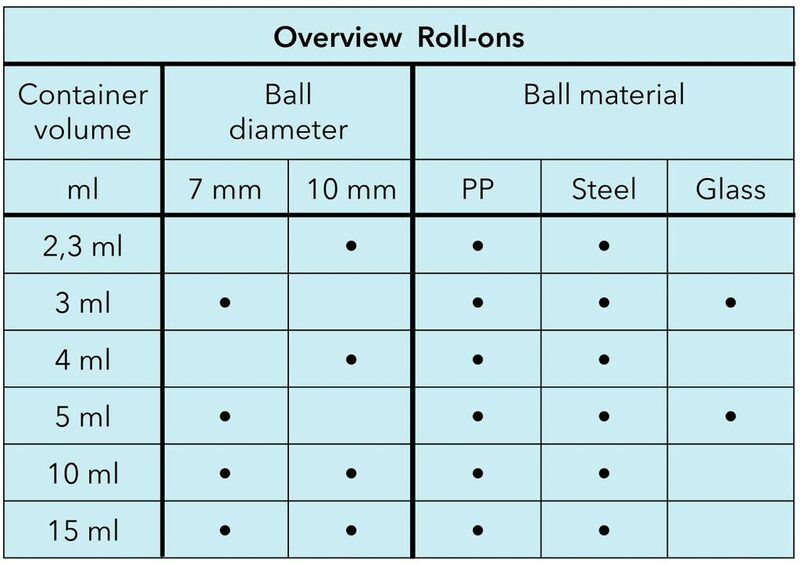 Mini roll-ons are not only practical, but they are also perfectly suited to consistent application of fluid solutions. Possible areas of application include lip care in the cosmetic industry or relief for skin irritations and insect bites in the medical industry. An airless plastic dispenser system is one of the best alternatives for preserving your product, and also ideal for formulations with very few preservatives. The desired quantity of the contents can be portioned out by a simple pumping mechanism without contaminating the remaining filled goods in the package with outside air or skin particles. Pump atomisers, lotion and foam pumps are optimally suited for the exact dosing of pharmaceutical or cosmetic products. Any conventional finishing process may be applied according to your needs. Sachets (sealed-rim pouches) are perfect for single-use applications. Sample tubes are suitable for multiple uses and offer a longer advertising impact than sachets. Sample cards featuring sachets or blister packs offer space for additional product information and add value. Folding boxes are a classic form of secondary packaging for your product. They protect bottles, tubes, and containers reliably against contamination, provide space for placement of your brand, and offer high-quality and secure packaging for your product. A variety of finishing techniques like embossing, painting, and film finishing increase the value of folding boxes. + Right from the start, we design the folding boxes to match the product packing planned for later. Upon request, we also design and produce sales displays for display windows and cabinets. We offer top-quality labelling solutions. With our reliable partners, we guarantee you maximum production security and efficiency. We would also be pleased to help you to design your labels upon request.